As we’ve discussed the dub of tri. and scraped for material to talk about we hadn’t already covered in the main articles explored the new perspectives it brought us, there have been a few recurring themes. One is experiencing it in English resonates with us better, especially those of us who associate Digimon with the voices from the old dub. Two is that additional dialogue can help break through some of the tense silences that slow down the movies, and inject humor into what can be a somber experience. Three is that the combination of these can bring clarity to the story and help us better understand what’s happening and why. All of those apply to the dub of Future, but it bears repeating when the dub uses all three so effectively in an overall performance worthy of a grand finale. On top of faithfully communicating complicated elements like the intentions of Homeostasis or Meicoomon’s memory storage, the dub does well to go just a little deeper into explaining things that might cause confusion. Matt’s insistence on the team sucking it up and continuing to fight is apparent, as is the support both Gabumon and Tai provide him when he almost fails to (Tai adds some verbal reassurance to their fist bump at the end). Hackmon accuses Gennai of “hedging his bets” by still using his Emperor form in the real world (suggesting a deliberate ruse, probably to fool the bureau). Daigo not only implicates Maki in the disappearance of the 02 kids, but also the cover-up preventing their absence from being investigated. While it can’t develop some of the subplots transparently glossed over, it does add enough to round them into something more cohesive to serve the overall narrative better. The best example is with Daigo’s sacrifice. While the underground lab scenario remains terribly contrived (although the implication that Gennai deliberately dragged them in there to play his sick game helps), Daigo reflecting on his mistakes with Maki is poignant enough, but the dub leans heavily towards the notion of stepping in to stop a friend who’s become the enemy. In Daigo regretting his inability to stop Maki, Tai gets the final reassurance he needs to avoid that fate and stop Meicoomon. Given his confounding speech at the end of Coexistence, that extra push to cement his decision was crucial, and it binds Daigo’s story with Tai’s with that much more elegance. As far as breaking up the silence, the Digimon never shut up in this movie. The grunts of the invading Digimon and attacking evolved forms persist, Patamon’s wing flaps are loud enough to distract while TK consoles Kari, and the random chatter is constant. It’s not always the most welcoming, especially when you’re anticipating moments like the early Matt/Sora conversation, but it adds so much life to the experience, and reminds us that as much as the story is about the kids, the Digimon are always there and, let’s hope, always will be. They’re also frequently silly, and while tri. usually restrains them during the truly pivotal moments, the corny lines recall the original dubs of Adventure and Zero Two, connecting us just a little bit more with our childhood memories of the show. Having the old actors helped out, especially in the early movies, but Future proved it’s not all about familiarity. The emotional heavyweights came from a new actor playing Matt and a new character in Meiko. While the new voice for Matt took longer to gel than TK’s or Kari’s, we buy in completely by the time he’s pouring his heart out to Gabumon (having good ol’ Gabumon reinforces it, but that alone doesn’t make the scene pop). The range of emotion Meiko has to cover between her fearless questioning of Hackmon to her tearful acceptance of Meicoomon’s fate can’t be ignored. As good as tri. is, it takes a dub of this caliber presented in the full movie format (bonus points for a theatrical experience) to make it shine brightest. 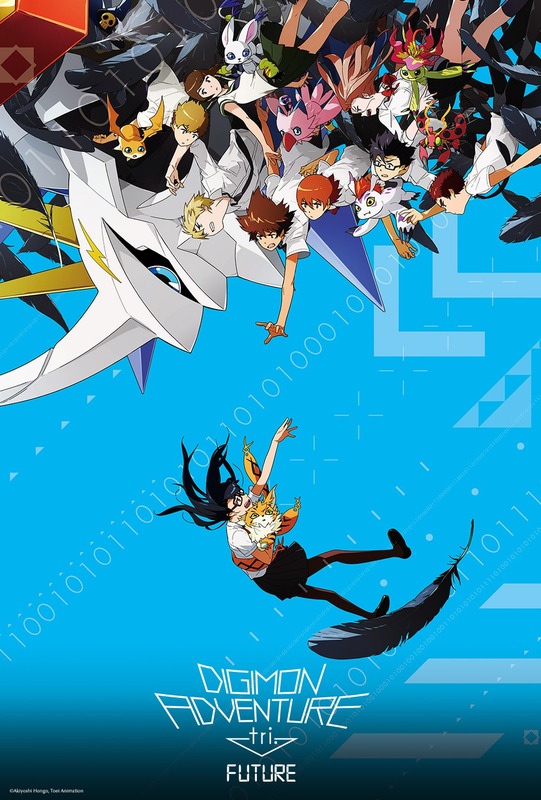 It can’t mask all of tri.’s faults, and it introduces its own sketchy moments, but in all we can come out of it feeling good about Digimon, eager for the future, and scratching our heads at a world where a Digimon dub is better than its sub. It’s not as consistent as, say, Data Squad, but it feels like more characters use “human world” in this movie as opposed to “real world.” It would be interesting to go back to see if anyone’s using one or the other with any regularity and what that suggests about them. Hoo, Sora and Gabumon do not mince words when talking about how much Matt misses and cares about Tai. Shippers on deck! Granted... Matt talking directly and sincerely to Tai later says a lot. The Sora/Matt scene has a couple nice additions where Sora emphasizes her concern for Kari before she shows the symptoms, and her saying Matt’s response for him. Biyomon also explains how she knows about Matt’s “awful” music post-reboot, claiming he sings in his sleep. Daigo says he “wasn’t as quick” to explain why he took the brunt of the damage from the fall. It doesn’t make a ton of sense, but at least they tried. Props to Izzy both for going appropriately ballistic when Hackmon suggests the reboot and the degree of concern and surprise when he reports to Matt that Davis, Ken, Yolei, and Cody (yes, he names all of them) returned from the Digital World. The single most remarkable fix was correcting the bit of cringe in Reunion when Meiko referred to “dandan” as “Meicoomon speak.” Not only do they correctly recognize it as dialect, but they realized that Meiko called it Meicoomon speak to conceal her accent... which is consistent with her behavior through the entire series if Coexistence was any indicator. Izzy refers to the data inhabiting Meicoomon as “fractal code.” Jury’s out on the accuracy of the terminology, but hey- shout out to Frontier! TK’s letter to Meiko refers to Tottori by name, but not the 02 kids (Daisuke was mentioned by name in the original). That’s our boy, dicking over Davis until the very end. And just to bring the house down, in the end when all the Digimon are clamoring to talk to Meiko, Gomamon complains that he hadn’t gotten to “say a word this whole episode.” Good night everybody! I noticed that too, no that never happen before in Seasons, I hope dub editor corrected it before release home video/itunes. I still don't know who voices Birdramon (Loss), Garudamon, Phoenixmon (Coexistence and Future) it's not Mona Marshall voices them. I knew that Doug Erholtz voices as Tai and Kari's dad just like he was voicing him from Season 1 20 years ago. Yeah I noticed he was Daigo too. Interesting he didn't replay his role as T.K. I don't know why he wont voices as T.K. for new movie.